Science has shown that our sense of smell is strongly tied to memory and emotion, so creating a beautifully scented home is sure to get you in the holiday spirit. Today we're sharing ten ways to give your house that Christmas aroma, using things like simmering stovetop mixtures, candles and even scented pinecones. Read on to check them out! It's a bit of an unspoken rule that our homes should smell delicious during the fall and winter. You've gotta have those berries. You should smell the pumpkin. We've rounded up a handful of ways that you can bring that scent right into your home and enjoy it all season long! How to: Make DIY Colorful Holiday Votive Candles with Hot Glue! I came up with this idea one night while watching Project Runway. Designer Justin LeBlanc created a hot glue embellished dress, and I wanted to turn that technique into a decorative holiday project for the home. The process was super simple, super affordable, and I totally love how they turned out. Let's make some! I love the versatility of the apple. Whether you eat it fresh, baked, pureed, or smothered in caramel, it's a wonderful thing. Did you know you can craft with apples too?! 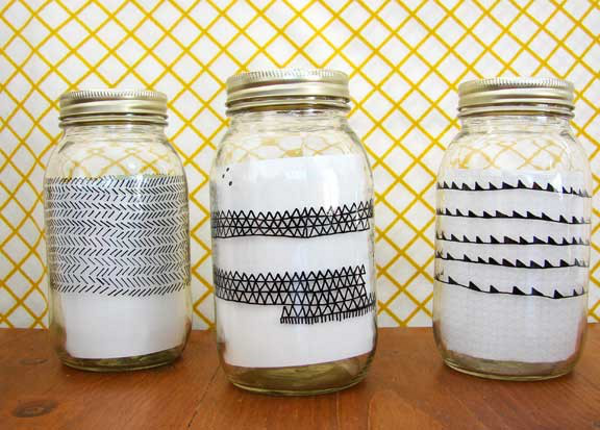 Make It: 3 Easy Holiday Candle Crafts! Oh snap. Did somebody say "glitter stripes"?! You won't believe how easy this is! Pretty soon you're going to be glitter-striping everything you own... that's a promise. Warm and inviting, these carol candle holders are perfect for moms and mom-equivalents this holiday season. The best part? They take minutes to make. Hi everyone, I'm so happy to be here at Curbly.com guest blogging about Hanukkah. I'm Sara of creativejewishmom.com, so if I can't tell you about Hanukkah, who can? As I know from my own blogging experience, most of us love the chance to learn about cultures and customs that aren't our own, so I hope that the information and ideas that I will be sharing here will be inspiring for everyone! Last week we featured a fantastic Pier 1 Giveaway, and this week the good folks at Pier 1 were kind enough to invite us in to do a little shopping. We were so excited to visit the store and get inspired to do our holiday entertaining .